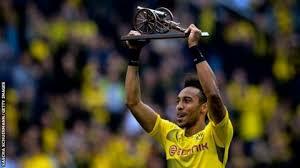 Gabon’s Aubameyang ends Bundesliga season as top scorer – Royal Times of Nigeria. Gabon striker Pierre-Emerick Aubameyang struck a late penalty for Borussia Dortmund on the final day of the season to finish as the Bundesliga’s top scorer with thirty-one goals. Aubameyang scored twice to help Dortmund beat Werder Bremen four-three his first coming three minutes before the break and his second from the spot in the eighty-ninth minute. It put the twenty-seven-year-old one goal ahead of Bayern Munich’s Robert Lewandowski who failed to score in the German champions’ four-one win over Freiburg. Aubameyang becomes only the second African player to win the golden boot in Germany after Ghana’s Tony Yeboah achieved the feat twice whilst playing for Eintracht Frankfurt in the 1992-1993 season and the following year in 1993-94. Borussia Dortmund’s victory over Werder Bremen gave them a third place finish in the Bundesliga and secured their automatic spot in the Champions’ League group stage.